In a recent fundraiser for my Relay for Life team, there were a few families of Irish descent in attendance, can you tell? These young people and many others decorated Luminary Bags which will have sand and a candle placed in them this Friday night and lighted in honor of their close friends and family who have been afflicted by cancer. Proof again this disease can affect anyone of any age. This entry was posted in People, Weekly View and tagged 18-200mm vr, blue eyes, boy, freckles, girl, nikon D70, outdoor, Photography, portrait, redhead, smile. Bookmark the permalink. Oh, such beautiful children! I wonder, do you suppose that Irish eyes always come with such nice freckles? Lovely, tender images, Scott. I was asking the same question, Gerry. 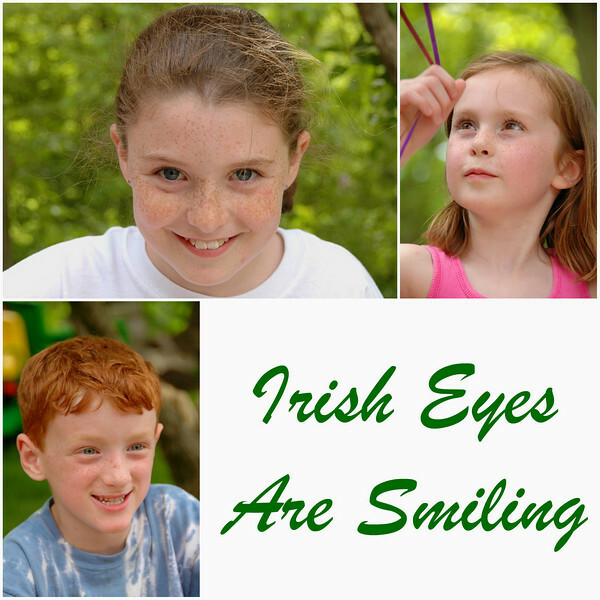 At least, with these families, the answer is yes, Irish eyes come dressed with freckles. Thanks, Tracy! Kids are fun to photograph as they are not as self-conscious as adults are. The first one where the girl has eye contact is special. There is ‘something’ there. I’d say…in a few years, any suitors are going to have their hands full with this gal. I agree with Carsten – the first girl is eye-catching; forgive the pun! I’d love to have the skill to catch beautiful faces in this way. Those are really great photos, Scott! Beautiful children! So young and fresh faced they were. It was enjoyable just being around them. The photography was a bonus. Such a wonderful blog ! Irish eyes smiling, the real ones and the song, the beautiful images of the island of the forty shades of green, so many good memories there. Thank you Scott, I loved it !